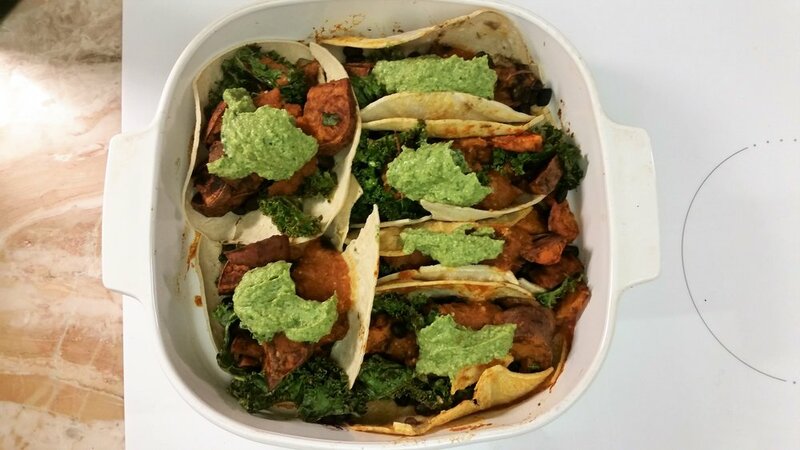 Smoky, hearty vegan tacos with black beans, roasted sweet potatoes, and kale! This perfect simple, 9-ingredient meal is great for Mexican night! Smoky, rich, spicy red enchilada sauce made with simple ingredients and ready in 30 minutes. Perfect for taking your Mexican inspired food to the next level. Heat a large skillet over medium heat. Once hot, add vegetable broth, onion, and garlic. Saute for 4-5 minutes, stirring occasionally, until tender and slightly browned. Add jalapeno peppers and cook for 2 minutes. Then reduce heat and cover. Simmer for 15 minutes. Add tomato paste, cumin, paprika, salt and oregano (optional). Stir, cover, and cook for 5 more minutes or until peppers are tender. Transfer to a food processor and blend until creamy and smooth. Taste and adjust flavor as needed, adding more paprika or cumin for smokiness, or salt for saltiness. 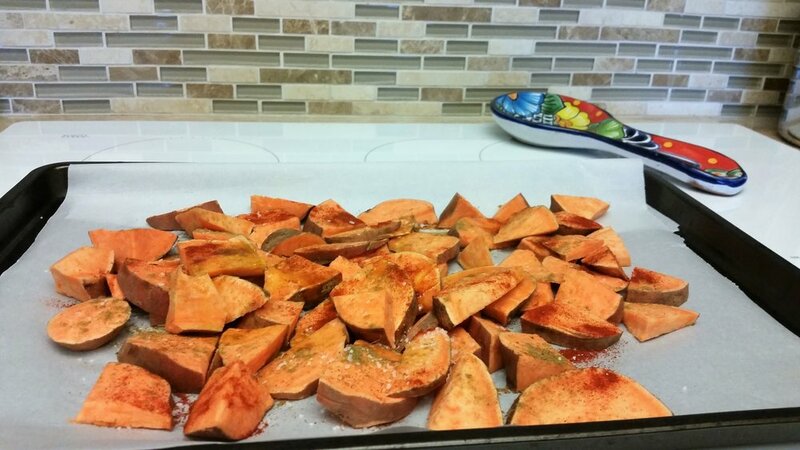 Add cubed sweet potato to one large baking sheet and drizzle with oil, cumin, paprika, and salt. Toss to combine. Bake for 20-25 minutes or until sweet potatoes are fork tender and slightly caramelized. Set aside to cool. Add drained black beans to a mixing bowl with steamed kale and roasted sweet potatoes. Add 1/4 cup of enchilada sauce to the kale and sweet potatoes and stir to combine. 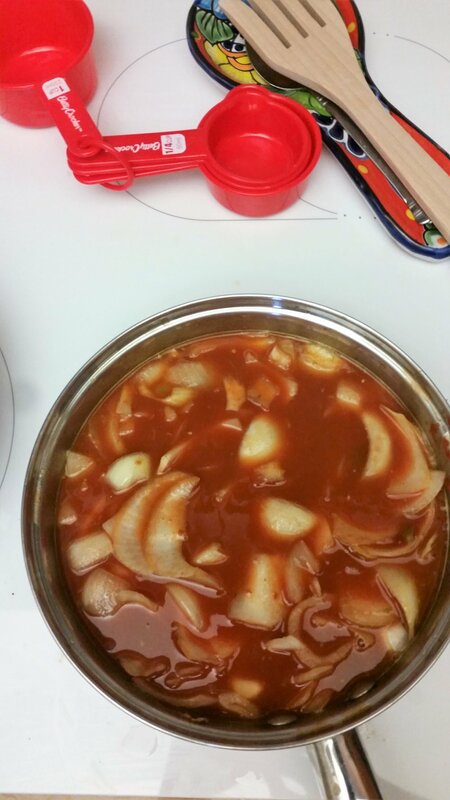 Pour about 1/3 cup of the enchilada sauce into the bottom of a 9x13-inch (3 quart or similar shaped) baking dish. Spread to coat. Lay one corn tortilla down in the saucy dish to coat. Then flip it over to coat the other side. Fill with ~1/3 cup of the filling. Then roll up. Continue until all tortillas are filled and rolled, adding more sauce as needed to moisten tortillas. Add any remaining filling to the edges of the dish. Bake at 350 degrees F for 15-20 minutes. Top with desired toppings and serve. I used a avocado sauce (see recipe below), but these tacos are delicious on their own! Directions: Blend until creamy and smooth. Need help planning your vegan or gluten free Meals? We can Help!